Packer: "I needed and wanted to be able to move on in life"
LONDON, England (CNN) -- Last summer, Phil Packer was told he would probably never walk again. On Saturday, he plans to finish the London Marathon. Employees of the law firm SJ Berwin cheer for Maj. Phil Packer, who was told he'd never walk again. He'll be the last one done. For everyone else, the race ended 13 days earlier. Packer has been walking on crutches for two miles a day, the most his doctor will allow, to raise money for charity. 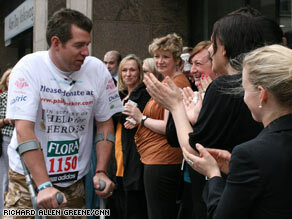 His goal: £1 million ($1.5 million) for Help for Heroes, a British non-profit supporting wounded veterans. Packer, whose full title is Army Maj. Phil Packer, Adjutant General's Corps, Royal Military Police, has been a beneficiary of the military-focused charity. On Thursday, an Army band, red-coated and bearskin-hatted, played in his honor as he reached the Tower of London, 12 days into his walk. The marathon is only part of his project, he says. In February, he rowed the English Channel, and next month, he plans to climb El Capitan, one of America's iconic mountaineering sites. It's a 3,000-foot vertical rock formation in California. The idea to take on the three challenges for charity came to him while he was in a hospital for more than four months last year following a serious injury in Iraq, he says. "I needed and wanted to be able to move on in life," he says. "I wanted to do something for other personnel who had been wounded. "I don't want to be helped. I want to help other people. Not that I'm not grateful, but ... you know," he says, an apologetic smile forming as he makes his way up the north bank of the Thames River, along the marathon course. "I really want to be able to help people." It is perhaps not a thought that would occur to everyone in Packer's shoes. The 36-year-old was wounded in the aftermath of a rocket attack on his base in Basra, Iraq, in February 2008. A vehicle rolled down a sand bank, striking Packer "head on" and dragging him under it, he says. "There was no one in it," he says. He steps off a curb onto the street: Right crutch, right leg, left crutch, left leg. "It was just one of those things," he says. "These things happen." Packer's lower spinal cord was injured, leaving him with no feeling or motor control in his legs, and no bladder or bowel control. "In hospital, I was told it was unlikely I would ever walk again," he remembers. That he is on his feet, walking the London Marathon under his own power, he attributes to "fantastic medical support" from Britain's Ministry of Defense and National Health Service. "So many improvements are being made" in medicine, he says. "It's an evolving process." He has no idea whether he will ever be able to walk without crutches, he says, or for any great distance. "I gotta see how it goes," he says. "Take every improvement as it comes." Packer is far from alone; the six-year war in Iraq has disabled untold thousands of people. Britain's Ministry of Defense did not respond to a CNN question about how many service members had been permanently disabled in the war. In the United States, the Congressional Research Service reported in March that 31,131 troops had been wounded in Iraq. That figure is for battlefield injuries. Many more veterans were later diagnosed with some sort of traumatic brain injury, but it is difficult to determine an exact number because of how statistics are kept. It's not clear how many of the injuries are permanent because the Department of Veterans Affairs does not classify some disabilities that way until 10 years after the injury, says Ryan Galluci of AmVets, a veterans service organization. Statistics for Iraqis are even harder to come by. Estimates of the number of wounded range from tens of thousands to hundreds of thousands. Iraq's Ministry of Heath says one in four wounded Iraqis have lost at least one limb. Under London's steel-gray sky, drivers honk their horns in support as Packer walks by. Construction workers stop and dig into their pockets to throw change into collection buckets carried by Royal MPs walking with Packer. And staff at the law firm of SJ Berwin line the road to cheer for him as he approaches. With two days left in his marathon, Packer has raised about £560,000 (about $840,000), he says. "I desperately need people to support me," he says. Prince Charles is among those who have expressed support. "You are, if I may say so, a credit to the Royal Military Police and to the British Army as a whole," the heir to the British throne writes in a letter posted on Packer's Web site, www.philpacker.com. Packer is still a serving soldier and intends to remain one, he says. "I've still got a career in the armed forces," he says. "I'm going to go back to it." He has 16 years of service under his belt, including time as an enlisted man before he went to officer training school, and is, he notes with a rueful laugh, 20 years from retirement. He's been asked to be an ambassador for Prince Charles' charity, the Prince's Trust, which focuses on helping young people, in addition to his life in what he calls "the disability community." All that is making him wonder if he is spreading himself too thin. "If you're going to channel your energy, you've got to have a plan," he says. "I know people with disabilities far worse than mine who are achieving amazing things."